OK, Shell splinter, Eye damage? 8.6.15 Granatspl. (itter) r.(echtes) Ohr und r.(echte) Wange verwundet. So....ear and cheek wounds. Ouch, but still lucky I suppose compared to many. Bravo!! Bravo!! I only got the "und r. ear ...wounded". 25th May - 13th Jun Kämpfe um die Wabengräben im Thiaumont-Wald und um die Thiaumont-Ferme 1. Bayer. Inf. Div. And parts of 2. Bayer. Inf. Div. 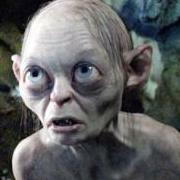 I think, he is from Baden, 1. Badisches Leib-Grenadier-Regiment Nr. 109.
please keep this card very, very safe! It is a valuable recollection because we 109er forced this part! ... this part! = a special location on the card on the other side? indeed it is... I will scan it later. 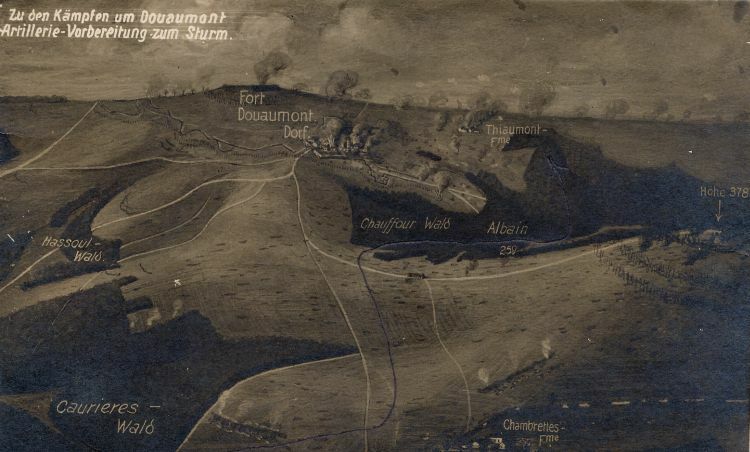 It is a superb superb superb superb topographical photo taken ariel view from the top if the Kegelbahn at Verdun, showing all the details of battlefield from the farm Chambrettes, up to Douaumont, the ravines and forest including Thiaumont farm. Is it possible to see the photo ? My Great Grand-father was killed near Thiaumont (29 june 1916). sorry, forgot, will get to it. He is listed as missing... but what is the other pencil mark? Could it be "von Granate z..."
According to this.... His mother was informed? This unit was in "Flandern" and "Franz Flandern" at this time. 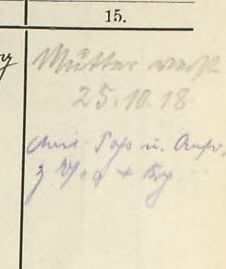 Is there other entries after this date in his Militärpass ? its the pencil entry UNDER the Flanders. 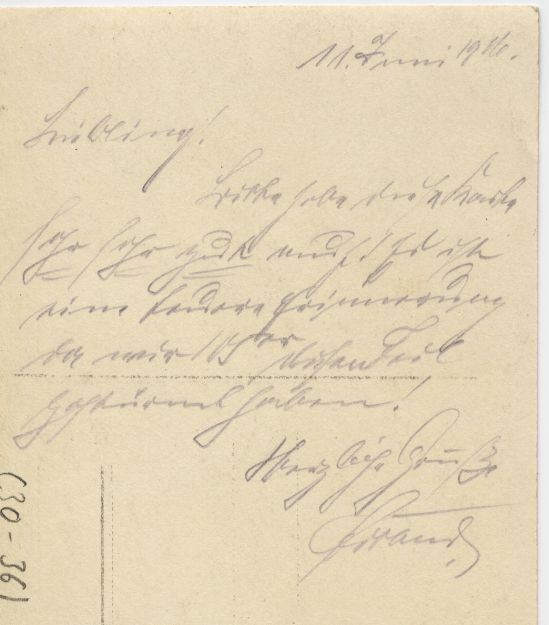 It's hard to read but could it be "nach Verzeichniss" ??? The Verzeichnis is the Gefechtskalender of the Regiment. Thanks, I should have thought of that! Any idea of the stuff on post 15? Chris, all I can make out is: Mutter verst. 25.10.18 (most likely in this case abbreviation for verständigt but it is also the abbr. for verstorben). The rest are more abbreviations, sorry.